Pilz Australia safe automation have launched the PSS4000 automation system and PAS4000 software suite that provide a new way to design, programme and implement automation. An important feature of the concept is the integration of safety, standard and motion control, as well as visualisation and diagnostics, with all data conveyed through a SafetyNET p Ethernet-based industrial fieldbus network. In addition, the software suite enables all aspects of an automation project to be accessed through a single interface. Benefits of the PSS4000 system are ease of use, a reduction in engineering effort and quicker time to market. The Pilz PSS4000 automation system takes decentralised machine control to a new level by virtue of the close integration of all aspects and the way in which configuration and programming of the entire decentralised control system is carried out through a single Pilz automation suite, the PAS4000. Material can therefore be copied and reused easily both within a project and from one project to another. Today machine designers specify the hardware then write the control programme to suit. However, any changes required either during the development or after the machine has entered service are cumbersome and costly to execute. With the PSS4000 and PAS4000, this approach is turned on its head. The programming phase can start as soon as the machine's basic functions are known, with the hardware specification following on or taking place in parallel. This saves time in the development phase and means that changes are simpler and less costly to implement. Another innovation in the PAS4000 suite is the programming of safety-related functions using tools that are compliant with the IEC 61131-3 standard for PLC programming languages. Pilz Australia believe safety has been integrated from the outset rather than added later, which means that it is closely integrated with the other aspects of the system than is the case with products from other manufacturers. The PSS4000 automation system suits a wide range of machine types, with the biggest benefits likely to be found in complex or modular machines. The hardware architecture also means that customers only pay for the functionality that they need. Three classes of PSS4000 hardware device are launched, which are all designed to withstand shock and vibration as well as temperatures of -40°C to +70°C. The PSSuniversal PLC is a programmable controller for safety and standard control functions. 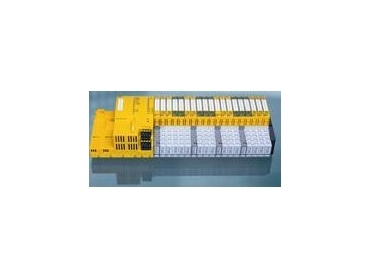 Up to 64 I/O modules can be connected for communicating with safety and standard devices. Each PSSu PLC features an integral power supply, an Ethernet switch and two Ethernet ports for programming, communicating with other devices on the SafetyNET p network and remote access through Ethernet TCP/IP. Configuration and programme data is stored on an SD card so that, in the event of the hardware having to be replaced, the SD card can be transferred to the new hardware and the system made operational in the shortest possible time. For smaller or less complex applications, the PSSuniversal multi is a functional expansion of the existing Pilz PNOZmulti modular safety controller. PSSuniversal I/O modules provide remote I/O connections for safety and standard devices, with two Ethernet ports, an Ethernet switch and a SafetyNET p interface. These three types of head unit can be used in virtually any combination within a single overall system, and each head unit can be fitted with a wide variety of safety and standard I/O modules. Up to five head units can be connected using link modules, with a maximum separation between head units of 100m. The backbone of the PSS4000 automation system is SafetyNET p, in which safety-related data and standard control data are physically mixed but logically separated. Pilz Australia have developed two speed classes of SafetyNET p, RTFN (real time frame network) for fieldbus class communication and for networking individual production cells with processing cycles of approximately 1ms and RTFL (real time frame line) for real-time communication in highly dynamic applications where an ensured scan time of 62.5µs or less is required. Both speed classes are compatible with each other and may be used separately or in combination. Users can create linear, star or tree topologies, or any hybrid of these, plus other industrial Ethernet systems or Ethernet-compatible devices can be connected to SafetyNET p.
Where non-safety wireless communications are required, Pilz Australia offer InduraNET p (Industrial Radio Network). InduraNET p modules are available to add wireless links seamlessly to a SafetyNET p network and, therefore, a PSS4000 automation system. In developing the PSS4000 automation system, Pilz Australia placed an emphasis on creating a user-friendly and versatile suite of software tools that enable all aspects of the system (safety, standard control, motion control) to be accessed from a single interface. Furthermore, the programming complies with the IEC 61131-3 standard and Pilz Australia have provided an extensive library of standard functions. Universal symbolic descriptions of signals, programmes and devices ensure clear plant programming and provide easier navigation and a more intuitive view of the control system. A system-wide mapping table aids clarity, prevents duplication of symbolic addressing, and makes it simpler and quicker to modify the system later. PAS4000 software licensing operates on a credit scheme in which function blocks and software modules are paid for on a per-use basis.